What if you need to ride in a shanked bit on the trail? What if you want to neck rein or show your horse and can’t use a snaffle? Try this! What I really mean by head down! After the last video where I talked about how low I get the horses to drop their heads, there were a lot of questions. In this video, I talk about what the horses should look like when they are gaiting and why we ask for the head to be so low. If you have any questions, feel free to comment below! The best thing you can do to help your horse gait! How do you say her last name?!?! Hey, guys, working on making more videos each week. Here is a short intro video. Make sure you subscribe and comment below on what kinds of videos you want me to make and what topics you want me to talk about. Okay, I admit it, there is no one bit for that works best for every gaited horse. However, I am going to list a few bits that I like and I am going to talk about why the bit doesn’t really matter too much in the end, except for the horse’s comfort. First off, let me say that you can train any gaited horse to gait in a snaffle or bitless bridle. You do not need a shanked bit. However, they can be good reasons to ride a horse in shanked bit, but not to get a good gait. Also, I want to mention that a snaffle is only a bit with no leverage. If the bit has any kind of shanks, it is not a snaffle. For the last couple of years, I have been using the Gary Lane Freedom snaffle, which I liked pretty well. You could use it as a simple snaffle or get the smallest bit of leverage if you clipped it to the reins. I still use this bit on occasion, but last fall I had the opportunity to try a new bit which has totally blown me away in how well it works and how much horses seem to love it. I recently heard about this bit, created by Mark Rashid. Since I bought the bit in September, I have been able to use in on almost 2 dozen different horses. Most of the horses seemed to really prefer this bit over their own. Some even had dramatic changes like going from only pacing with their head high to gaiting with their head low in 5 minutes! So, the Rockin’ S Raised (ported) Snaffle is the bit I like the best at the moment. However, as long as your horse is comfortable with the bit you have, I am not urging you to buy a new bit. I will say that many horses do not like bits with a single joint for the mouthpiece. When you pull back on both reins, the middle of the joint can poke the top of their mouth, causing them to raise their head. This is the opposite effect of what we want. I encourage everyone to pay attention to their horse. He may or may not actually like the bit that he has. Don’t just use a bit because that is what he was used to before. If you can borrow bits from friends or fellow boarders, try as many as you can and find one that your horse seems to like. I have seen dramatic changes when changing from one snaffle bit to another, from a single jointed bit to a french link kind of mouthpiece. With the Rockin’ S Snaffle, I have seen horses go from tossing their heads, to being comfortable carrying a bit, start gaiting in one session, and give vertical flexion without any resistance. Additional info about the Rockin’ S Snaffle. Myth 1: Gaited horses just gait on their own. This is true and not true. Gaited horses do have the ability to gait; that part is natural. However, they are not born just gaiting smoothly. Many gaited horses pace, trot, or do something in between that is not as smooth as we would want. To get that perfectly even, smooth gaits takes time and training. 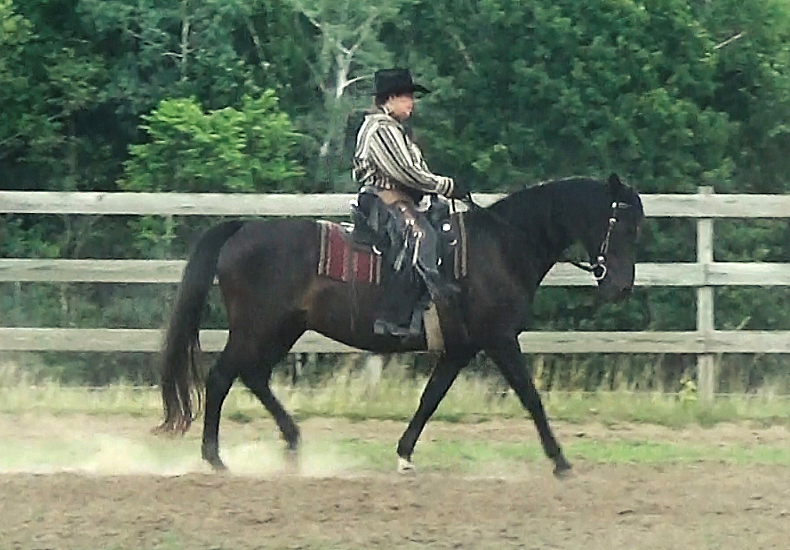 Myth 2: You need a shanked bit or a “gaited horse bit” to get them to gait. I have trained numerous gaited horses, all different breeds, to gait with a plain snaffle or with just a hackamore. The key is to train them to gait, not play at forcing them into a particular head set. Myth 3: Gaited horses need their noses tucked in or “collected” to gait. Once a horse learns the correct way to gait (meaning the correct footfall), many of them like their head level with their withers and their nose slightly out. They travel with a long, level gait that is super comfortable because the horse is relaxed. Horses do not need the reins held tightly once they have learned to gait naturally on a loose rein. Myth 4: You need to know the name your horse’s gait. Names do not mean anything to the horse or your backside if it is not smooth! You should focus on getting a gait that is smooth and easy to sit, at both a slow speed and a medium speed. Many of the breeds do the exact same gait, but they call them different names. Use your judgment and decide what your priority is. Myth 5: You can never canter your gaited horse. I am asked this one a lot. I always make sure the gaited horses I work with are comfortable cantering a little. However, I never ask for the canter from the gait, always from the walk. Gaited horses should be able to gait quickly without breaking to the canter. If we are always asking for the canter from the gait, they will not learn to gait quickly, but will rather break to the canter. Who ever coined this myth maybe didn’t know there is a BIG difference between letting a gaited horse choose to trot off in a hollow fashion versus teaching a gaited horse to trot on cue in a quality way of going .The former is letting the horse train the rider. The latter is the rider training the horse. Trotting the gaited horse isn’t for everybody and every horse, but if you ask me, teaching a gaited horse how to trot (or soft trot) on cue and in the right posture, has many benefits that can actually improve the quality of their easy gait. Trotting with back to front connection and engagement develops the top line muscles, rhythm, balance, forwardness, breaks up pace, and results in a deeper stride reaching under the body. When my friend brought her trail horse, Lady, to my place, she had two gears: a dog walk and a hollow hard trot. My friend wanted to know if Lady had an easy gait in her, because she was told that Lady was a gaited horse. I’ve ridden Lady on and off the last three summers. My strategy has been to speed up her walk just before she breaks into a hard trot in order to develop a smooth, easy gait on cue. It isn’t that showy, but it is smooth, and nothing beats Lady on the trail in her easy gait! It’s fun to ride, and we see a lot of the forest in a short amount of time. Then last Fall, I began to ride Lady with more contact using a mild snaffle bit. Previous to this she had always been ridden trail style on a loose rein. In July 2016, I entered Lady in her first dressage show—a North American Western Dressage (NAWD) Virtual Show which was open to gaited horses. I was thrilled that the show didn’t require that Lady be registered in order to enter. We rode NAWD Intro 2 which includes walk, freewalk, and substituting jog trot with gait. Lady was the only gaited horse competing against trotting horses and placed 5th of 9 horses with a score of 60.357%. For her first go at it, I was tickled! The judge provided wonderful feedback. She said that overall Lady seemed tense in the bridle and lacking engagement. She pointed out a section in the test where Lady was moving well in relaxation and engagement and to shoot for more of that. This was very helpful feedback! You see, for the last three summers, I’ve focused on developing a SMOOTH gait, not so much on producing engagement or connection. So now that Lady has established smooth, I studied the video, took the judge’s feedback, and began to work on engagement and a soft connection with relaxation. Lady’s response wasn’t rainbows and unicorns. She resisted the engagement by rushing off in shorter steps and then she blasted off into a hard, hollow trot. Then I had an idea. Back in my trotting horse days, I spent many miles trotting in a rounded working frame on a 20-meter circle to develop the top line muscles, rhythm, balance, and engagement. So that became my strategy for Lady any time she resisted engagement and connection with a soft contact in the easy gait. I asked for a quality TROT on cue. Huh!? I know what you’re thinking: Why would I trot a gaited horse that I just broke from hard trotting?! Let me explain. There is a big difference between Lady choosing to blast off in a hollow hard trot and me teaching her a quality trot on cue. Lady’s hard trot was stiff in the jaw and back. Her under neck was bulging, and she ran away with me. Her hard trot was an evasion to get out of working in the easy gait. Left unchecked, this is an example of the horse training me, the rider. Teaching Lady a quality trot on cue has many benefits. When riding her with a relaxed jaw, connection from back to front produces engagement, rhythm, balance, and strengthens the top line muscles. 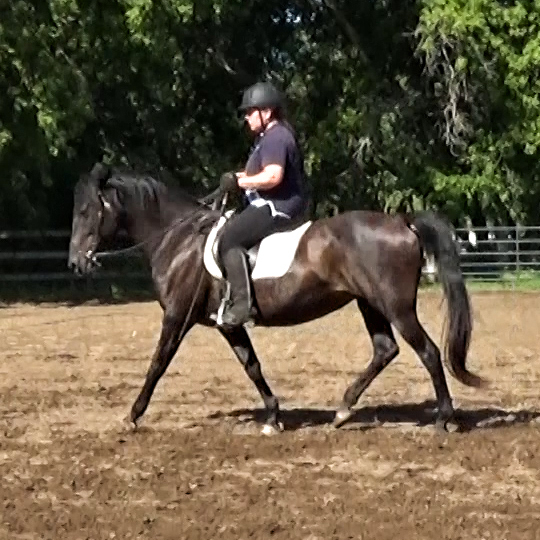 This type of trot produces depth of stride which improves the quality of her easy gait. It is an example of the rider training the horse. 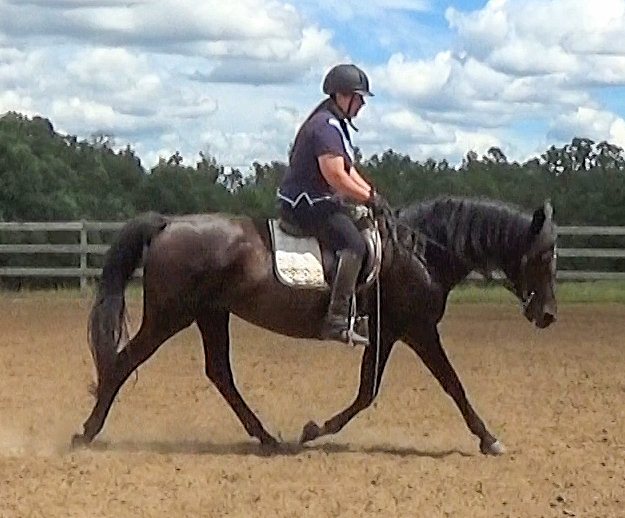 Teaching a gaited horse how to perform a quality trot (or soft trot as shown) on cue has many benefits: engagement, rhythm, balance, strengthening the top line muscles, and breaking up pace. This type of trot produces depth of stride which improves the quality of the easy gait. Then after a few circles of quality trot on cue, I’d cue for the easy gait, and I am amazed how much better the easy gait has improved after a few circles of trot. Lady’s easy gait improves in engagement, rhythm, and balance after a few 20-meter circles of quality trot on cue. It didn’t take Lady long to prefer the engaged easy gait over the quality trot. My strategy was to ask for an engaged easy gait first, and if her response was resistance, then I cued for the quality trot. After a few training sessions, our trotting on cue became less and less to none at all, because she offered the engaged easy gait on cue without resistance. In September 2016, I entered Lady in her second NAWD Virtual Dressage Show. Not only had Lady’s easy gait improved with engagement, but she placed second of 11 horses in NAWD Intro 2 with a score of 64.821%, and she was the only gaited horse! Trotting the gaited horse isn’t for everyone or every horse. It has helped Lady and I establish more engagement in the easy gait and now that she is working in a quality engaged easy gait, with connection, rhythm and balance, we haven’t had to resort to the trot on cue. Who ever coined the myth, never trot a gaited horse, because trot will ruin their easy gait, maybe didn’t know the difference between letting the gaited horse evade by trotting hollow at will and training the gaited horse to trot on cue in a quality way of going that brings about rhythm, relaxation, balance, and forwardness to develop engagement, a soft connection, a deeper stride beneath the body, and breaking up pace. That’s where years of dressage lessons on trotting horses have paid off for me. I never imagined that I would be trotting a gaited horse. I got into the gaited thing for a SMOOTH ride, but in the end, that’s where we are now, because I discovered that Lady prefers an engaged smooth easy gait over an engaged trot any day. That makes us both happy! If you liked this article, click below to sign up for more free info.